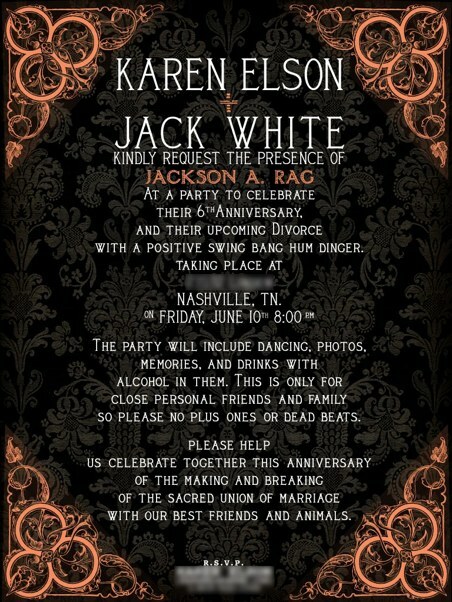 karen elson and jack white announce today that they are getting divorced. “we remain dear and trusted friends and co-parents to our wonderful children Scarlett and Henry Lee. We feel so fortunate for the time we have shared and the time we will continue to spend both separately and together watching our children grow. After meeting on the set of The White Stripes’ music video “Blue Orchid”, White and Elson married in June 2005 on the banks of the Amazon River. Outside of marriage, White and Elson were also musical collaborators. White produced and released Elson’s 2010 debut, The Ghost Who Walks. This is White’s second divorce, having split up with his White Stripes bandmate, Meg White, in 2000 following a four-year marriage.